Tempered vs heat strengthened glass|Bear Glass +17188323604 | Bear Glass a full glass fabricator in USA. Toughened or tempered glass is a type of safety glass processed by controlled thermal or chemical treatments to increase its strength compared with normal glass. Tempering puts the outer surfaces into compression and the inner part is in tension. Such stresses cause the glass, when broken, to crumble into small granular chunks instead of splintering into jagged shards. The granular chunks are less likely to cause injury. In areas where high traffic and human contact may be anticipated, tempered glass is the perfect solution in both residential and commercial applications. 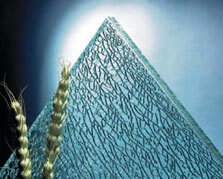 Tempered glass resists high wind-blown debris and is ideal where breakage could involve a safety concern. If subjected to stresses beyond its capacity tempered glass disintegrates into small pieces, greatly reducing the risk of serious injury. 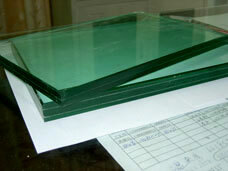 Heat strengthened glass in produced by heating the glass to approximately 1,300Fo and then rapidly cooling it with air. The resultant glass is thermally strengthened and approximately 2 time stronger than a piece of annealed glass. 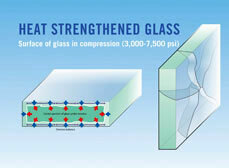 Heat-Strengthened Glass is produced similarly to tempered glass. 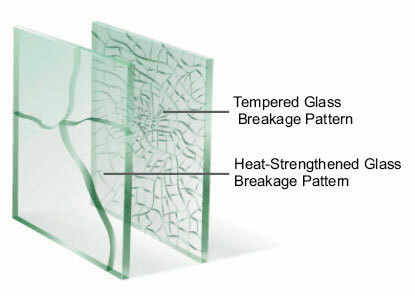 Heat-Strengthened Glass is approximately twice as strong as annealed glass with significantly greater resistance to thermal stress when compared to annealed glass of equal thickness. Heat-Strengthened Glass is NOT considered a Safety Glass product as defined by the above mentioned glass standards, and typically breaks into larger pieces than tempered glass.